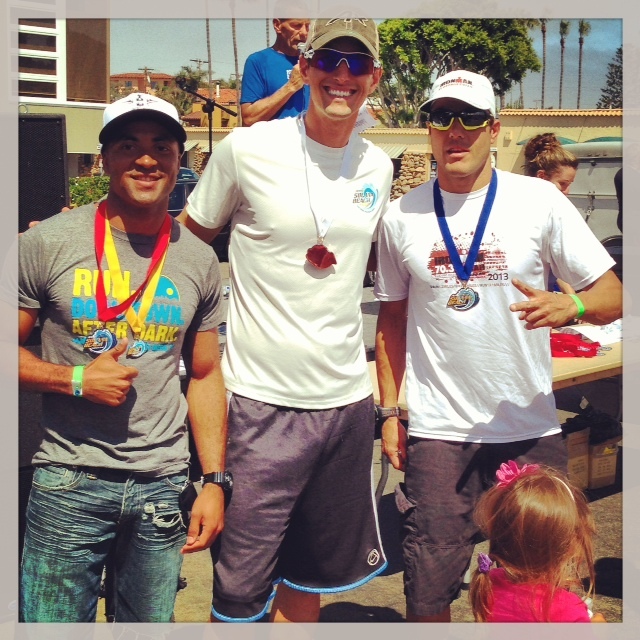 The Solana Beach Sprint Triathlon was definitely not on my radar as an event in 2013. In fact, I wasn’t sure I would even be doing any triathlons in 2013 as I hadn’t had the desire to swim or bike (even spin class) in over 9 months. 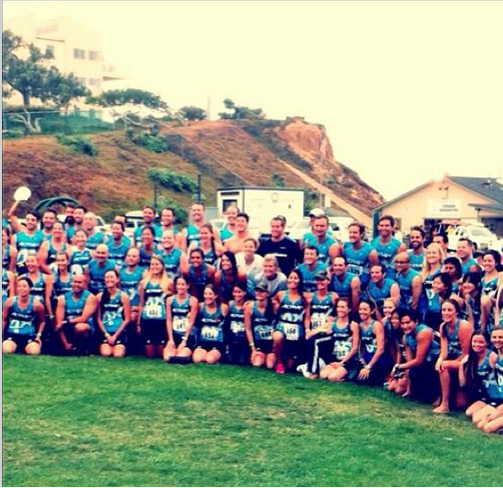 However, since Mike switched jobs at ACTIVE, moving out of his manager role into a role on the ACTIVEx team, I knew it’d be a fun opportunity for me to race Solana Beach and attend the various events leading up to it, so I signed up. I was really glad I did because I had an amazing time at the 3 day ACTIVEx Endurance Camp, the Mock Tri and the three open water swim workouts I attended, including the celebratory Bubbly2Buoy event the Friday before the race. The race on Sunday was just the icing on the cake and for once I actually had “fun” at a race that I didn’t put 100% into training for (I’ve tried racing for fun but find that it’s not as fun to race knowing you didn’t put in the work to achieve your goals). 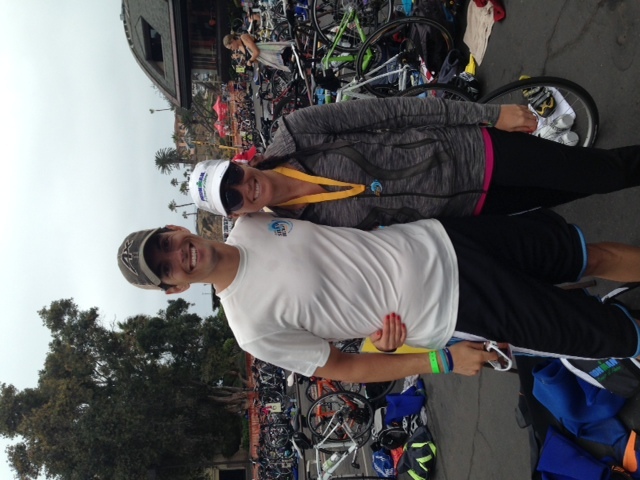 Luckily the race was short enough that despite little swim or bike training, I still did pretty well! We arrived at the race extra early so Mike could help with any ACTIVEx things that needed to be done and as soon I entered transition I found Brooke, who I had become friends with at camp. I told her to move her stuff to a better spot on the racks since we were one of the first ones there and we set up next to each other and chatted along with some other ACTIVE girls. Transition time always goes quickly and before we knew it we were lubed and suited up and on the beach. Mike and I did a quick warm up jog down the beach and then I saw Brooke again who I’d been separated from and she and I did a quick warm up swim and then got lined up for the 29 and under wave (although I turn 30 on December 25 this year, I’m still considered in the 25-29 year old age group because Solana Beach is not a USAT certified race!!! Wooo! Those 30-34 year olds are FAST!). When the whistle blew, I took off running into the water. The swim is only 400 meters but it’s a beach start and there are waves to navigate before you can begin swimming. I tried to run hard but not too hard not to waste too much energy and I ran as far as I could into the water, l lifting my legs high to avoid drag. 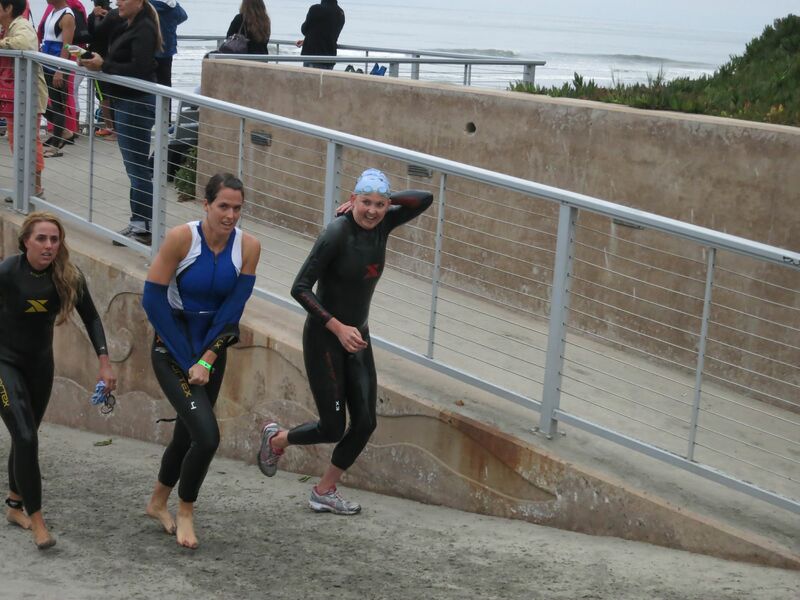 Since it was all women under 29 who started in my wave, there were several TriJunior girls who were absolute machines and were already way ahead from sprinting faster than the pack into the water. It was impressive! Once we started hitting breaking waves, I dolphin dove under one or two and then started to swim. The first buoy seemed to take FOREVER even though it’s such a short swim. This always happens to me in triathlons – the swim always seems to take forever. By the time I rounded the first buoy the 2nd and 3rd came quickly but then again the swim to shore seemed long. I was pretty sure Brooke and I were swimming near each other and I thought I saw her just ahead. When we got to shore and popped up, sure enough there she was right with me! Coming out of the water with Brooke! Transition for this race involves running up the beach and then up a steep ramp up to the park at the top of Fletcher Cove. Brooke and I met each other at the bottom of the ramp and started running with a ton of ACTIVExers from later waves cheering us on. She’s a crazy fast runner and literally sprinted up the ramp and I fell behind, totally winded! I saw her in transition briefly and she said before she left, “I’l see you out there! 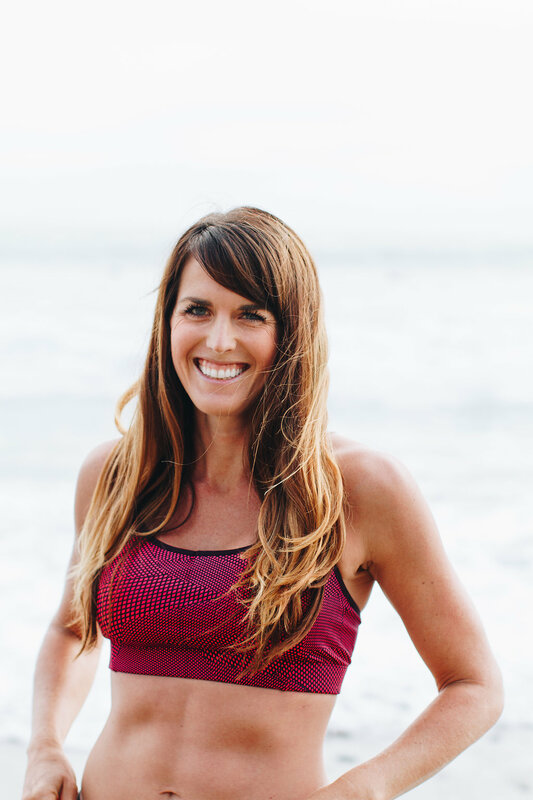 I’m sure you’ll catch me!” This was Brooke’s first triathlon and she had picked up swimming and biking VERY quickly – her fitness from being such a great runner definitely transitioned and she seems to be a natural athlete. I then decided my goal for the bike was to catch her! I thought catching her would be easier. I had a hard time clipping in for some reason and then when I first started to ride my legs felt heavy. I focused on a strong effort without pushing too hard at first. The bike course is 9 miles and it’s two loops. Each loop has THREE u-turns, two of which are very, very narrow. One of which was so narrow you have to literally slow to a near stop and I thought I would fall over. I’m not a confident cyclist and these u-turns scared me and really slowed me down. I definitely would like to work on some technical bike skills for next year’s race! I pushed it hard on the bike. 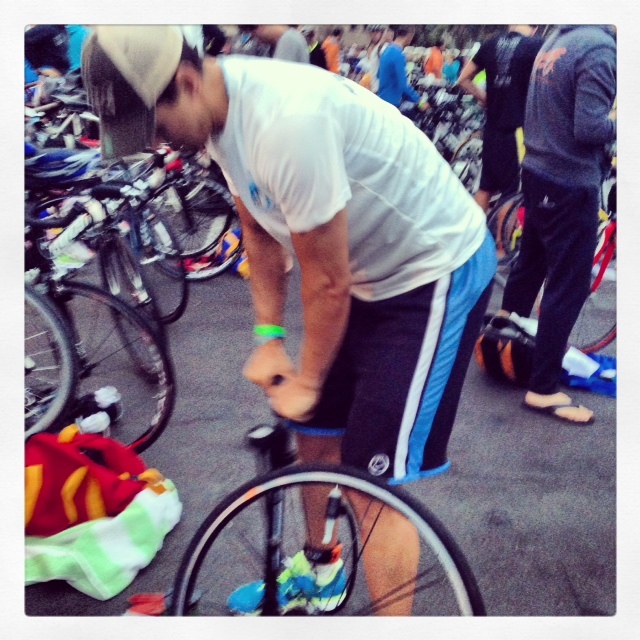 Harder than I have in past triathlons – my breathing was heavy and my legs were on fire. I basically pushed it at 85-90% max effort for the entire leg. Mike’s wave started 10 minutes after mine and on my second loop I got to see him twice which was fun! I had no idea how I was doing in the field at this point but I did know a few women were ahead of me. I passed two in my age group on the bike which was nice especially since typically I’m toward the front of the swim and not a strong cyclist so I get passed. 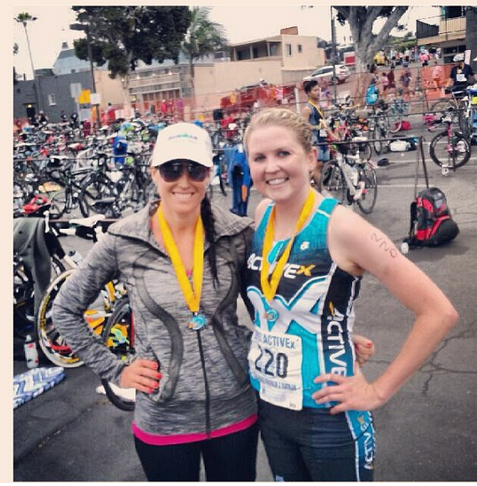 Despite pushing hard, I really had a fun time – next year I really want to wear an ACTIVEx tri kit because it was so fun cheering all the ACTIVExers on. Finally right after the final u-turn with less than 1 mile to go I caught Brooke and I said to her “you’re fast! Took me forever to catch you!” as I passed. She then stayed with me and we rode the final mile or so together and then ran into transition together. It was fun having a buddy out there! Brooke and I were in transition together but she transitioned much faster because she is still using a borrowed bike that doesn’t use clip ins! She is so fast without even having a spiffy bike! I knew she would crush the run so I told her to go run down the girls in front of us! My goal for the run was to run sub 23 and I came so close! I didn’t wear a watch for this race so I had no idea but had I known I would have pushed it a bit faster. Coming out of transition the announcer said “all the front runners in the young women’s division are starting the run!” so I knew I was somewhat in front of the pack. Me, Brooke, another ACTIVE girl I met at camp named Margaret and one other girl were all in transition and starting the run together. Brooke had taken off fast and Margaret was right ahead of me. However, as soon as we started to run, I could tell Margaret was faster and I kind of dropped back, just trying to steady my breathing and not focusing on catching her. I knew from the camp that she was a strong runner and I kind of just decided to run my own race at this point. 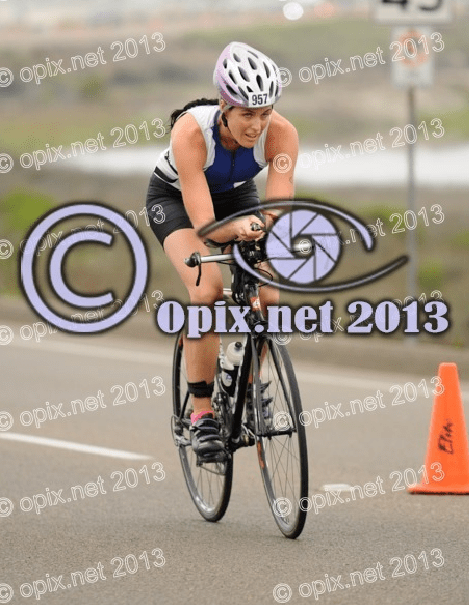 Soon after, I caught the other girl from transition and passed her. It seemed like a really long time until I hit the mile 1 marker and I felt tired. I told myself it was only 2 miles to go, shorter than a run from the Kook to home, and that I could do it. The run is also two loops so when I made the first u-turn I could see who from my age group was on my tail, if anyone. No one was so I knew I didn’t have to push it too hard to not get caught. I let off a bit and let myself relax for mile 2. I saw Brooke at another crossing area and knew she was moving because she had already moved very far ahead. I was excited for her and cheering her on – I definitely had no ill will toward her and was very happy that she was enjoying her first race while also dominating it! 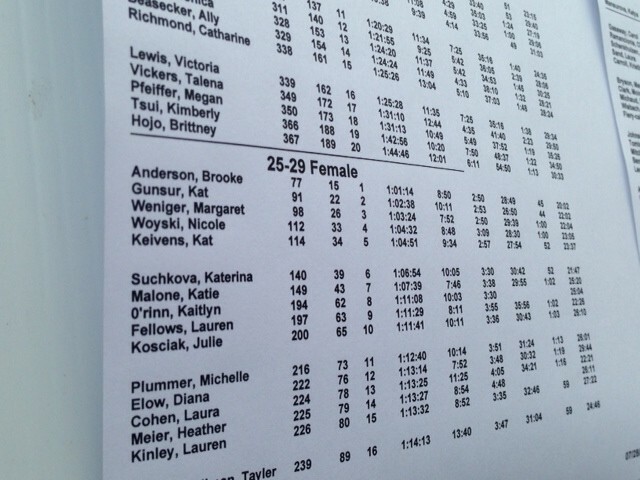 Around this time I realized that there were three girls in my age group ahead of me that were slower. I passed on easily and then worked hard to pass another. I knew for a fact that girl was ahead of me off the bike so I was happy to pass her. I halfway expected her to keep up with me after I passed and it’d be a race to the finish but she didn’t. 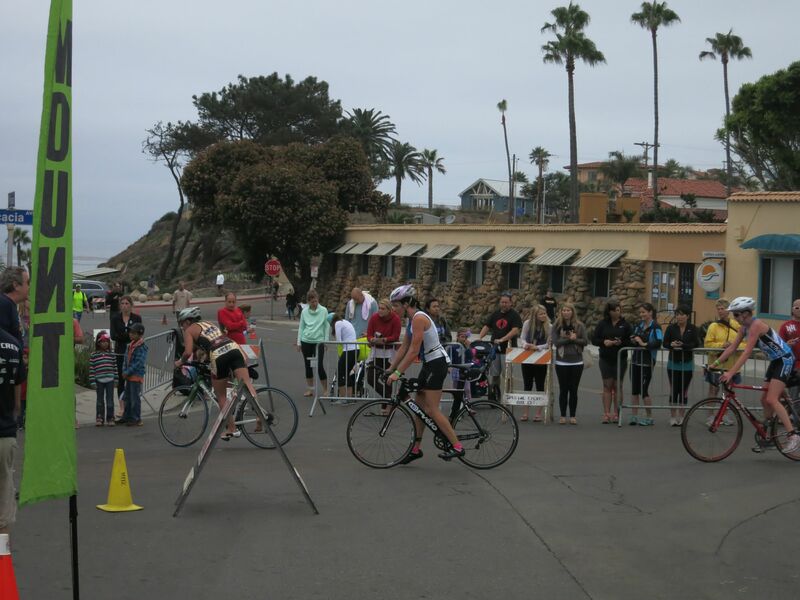 I then spotted another girl in my age group and worked hard to pass her and did so in the final 1/10th of a mile or so. she made no effort to keep up and later I realized that two of the three of the girls I worked hard to pass weren’t even ahead of me – they were just on their first loop of the run! 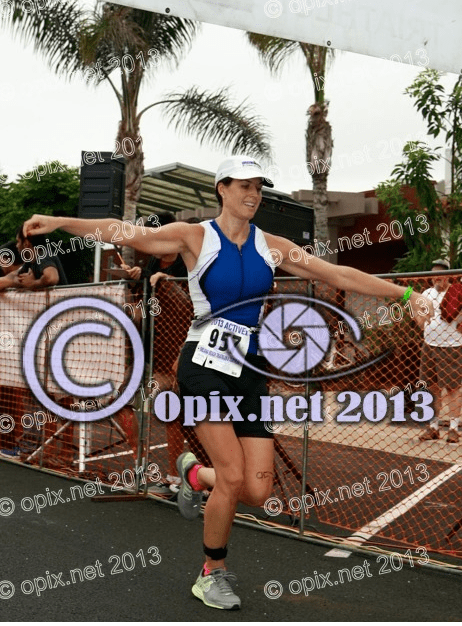 I pushed it hard down the finishers chute and finished strong with my arms in the air! It was a fun race and I was proud of my finish, hoping I’d made it in the top 5 or at least 10 and knowing I didn’t make the podium. Mike, who had started 10 minutes ahead of me, finished about 1 minute behind me so we met up and stayed at the finish line cheering on fellow ACTIVExers for a while before heading to transition to change out of our wet clothing (it was actually a fairly cool morning and my tri suit was still very wet even though I never poured watch on myself during the run). I saw Brooke in transition and told her she should check the results because she probably got on the podium. She said something like “Oh no, maybe top 10 or something.” I tried to convince her that she should check and when I later checked the results, I was right! Brooke finished first in our age group! I finished 4th and was thrilled since I had low expectations going into the race. 3rd place was Margaret who ran a 1 minute faster run than me. 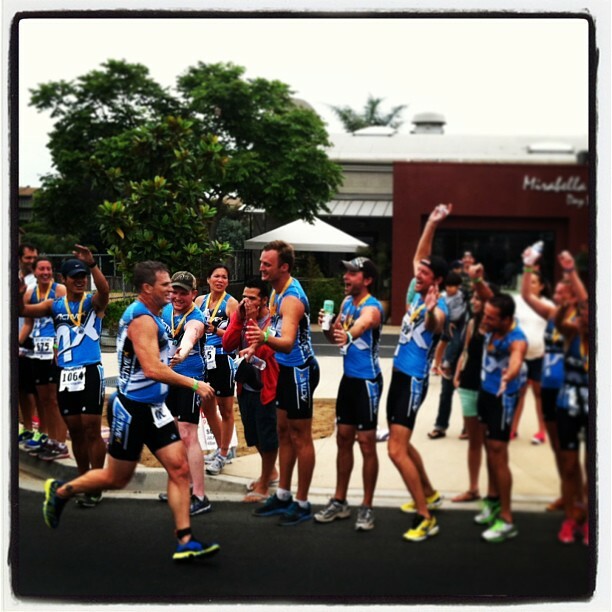 Cheering on Arch as he finished the race! Mike came out with 3rd in his age group so we waited for the awards ceremony. I was so proud of him! In the meantime in my triathlon-high state, I tried to organize a group to train for and race Vineman 70.3 for next summer. My love for triathlon did come out at this race and I started to get excited to train hard and race better next year, even though I’ll be in the more competitive 30-34 year old age group. 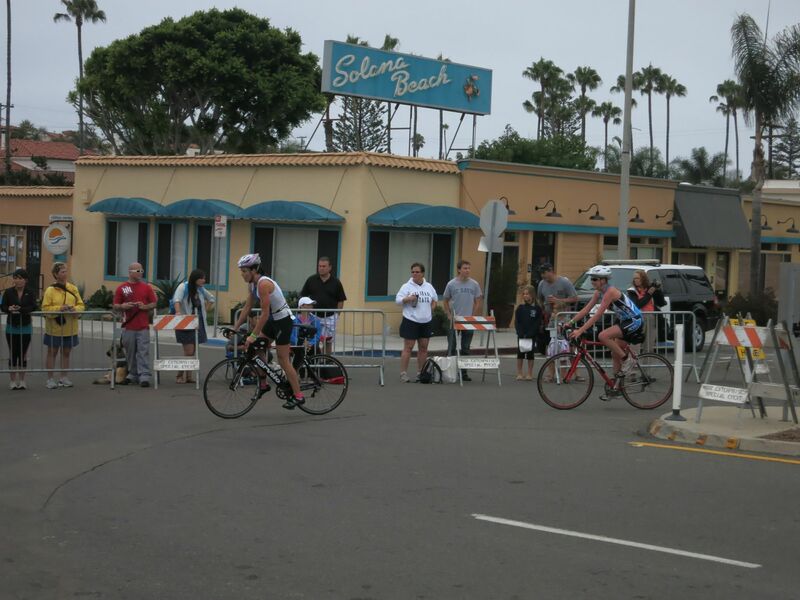 Solana Beach Triathlon is a great race and I definitely recommend it for beginners as well as those looking for a competitive group of athletes to race with. It’s short but tough and VERY fun!